Making a good loaf was another matter. My attempts were never inedible, but I was usually disappointed by the rise, the crust, or the crumb structure. There are plenty of recipes online to choose from, and I also used Dan Lepard’s The Handmade Loaf . But of course I was using French flour, which is not the same as either American or British flour. I persevered, and the “Aha!” moment eventually came with this video. Actually seeing someone working with the dough made it much easier to understand what the consistency and appearance should be like. Of course, I still needed to adjust the proportions to work with my flour, but even my first attempt was so much better than all previous efforts that I was encouraged to keep going. So I highly recommend the video and associated recipe if you are struggling with sourdough, or just want to get started with it. I haven’t looked back; I’m now making a couple of loaves a week, and I am confident I can always get good results. Of course they will vary because sourdough is not an exact science, but I always get a good rise, beautiful open crumb, and a satisfying crisp crust. I almost always start the bread about 9 p.m. and then let it rise in the fridge overnight. The next day I take it out and let it warm up a bit before shaping it; it then generally needs about another three hours at room temperature before baking (with sourdough, patience is an essential virtue!). I bake it in a Le Creuset oval casserole into which it just fits; it’s important not to use one that’s too big, otherwise it will spread rather than rise. And also dust dough, cloth, and your hands very liberally with flour to prevent disastrous sticking when transferring the dough to the hot casserole! To slash it, I use a craft knife blade — you do need something razor-sharp. Handily, the proportions I ended up with after experimentation are easy to remember. Here they are, for standard French bread flour as stocked in the supermarket (see the Stella Culinary recipe for the method). Note, this assumes that you always feed your starter with equal weights of flour and water: I always give it 50 g of flour and 50 g of water, once a day (unless it’s in the fridge, in which case once a week is enough to keep it alive). It needs to be lively and frothy when you use it — 12 hours after a feed is good. The only remaining problem is what to do with all the spare starter! Each time you feed it, you need to remove half, if you don’t want it to take over your kitchen. I’ve tried various recipes, including cakes and scones, but not been wildly impressed, and they don’t use much starter anyway. The best and easiest I’ve found is sourdough pancakes. I also now use sourdough to make my English muffin recipe , with great success — I still make the dough in the breadmaker, but give it much longer to rise before cooking. Other suggestions are welcome! 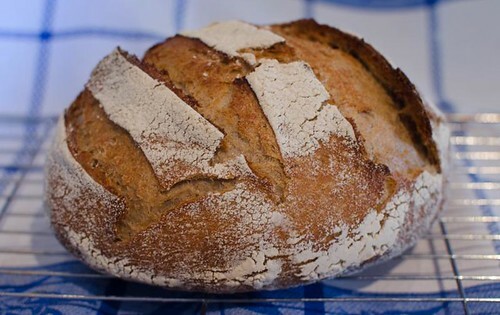 Great to read about your sourdough experiments, Veronica!! Well done for persevering, the results show that it was worth every bit, and I can just smell the bread from here!! I started baking bread when we first moved here, and always enjoyed pulling out a loaf and hearing the crackle of the crust. Great job Veronica. Alain has a starter here in Maine and we enjoy wonderful sourdough bread. His name is Petit Jean and we do our best to keep him happy and healthy. The bread is SO much better then store bought bread!